I think maybe they have teeth missing in the same spot! that he wanted to be a wizard, but a wizard he is! It is mind-blowing to me that my last baby is 3 years old already. That makes him officially out of the realm of "baby," even out of the realm of "toddler," and smack-dab into "preschooler." Already. Wasn't it just yesterday when I was holding this tiny child, who couldn't even hold his own head up, in my arms? And now look at him! He can do so many things for himself, and while right now he still does need me very intensely, I can see how this is going. Pretty soon he, like his brothers, will be independent in most areas. Which is, of course, what I want--I certainly don't want to be brushing my kids' teeth and tying their shoes before they head out to work each morning--but oh, there is something so special about being the one thing standing between an innocent kidlet and the big, cruel world--about having a little person depend upon you for every little thing that sustains them. I'm going to miss it. I decided to finally change sheets this morning--it's time for cozy flannel on the big bed :-) It's actually only been 2 weeks since there were clean sheets on my bed, but I'm not really sure how long it's been for the boys--their sheets didn't stand up on their own or anything when I removed them, so not too terribly long. All of the boys I gave birth to were in the shower when I went in to ask the younger two which sheets they would like on their beds. After ascertaining that Logo would like sports, and Bubby would like Cars, I was walking away to dutifully pull out said sheets and apply them to said beds, when I overheard my first-born comment to his brother (insert your best pre-teen angst/drama here), "oh, I am soooo glad I don't have to deal with that." Pausing, I heard MC echo my thoughts, asking, "what do you mean?" "Well," Code-man replied, "I get to change my own sheets, so I get to decide when and how I want to do it." 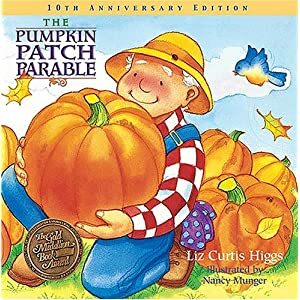 Today, Bubby, Pal, and I read this cute book, The Pumpkin Patch Parable, by Liz Curtis Higgs, suggested by my MOPS group's Moppets coordinator. Once there was a farmer, who planted many different kinds of vegetables on his farm, but the best were the pumpkins. He planted the seeds and the pumpkins grew. They were all different shapes and sizes, but they were all pumpkins. At harvest time, the farmer chose one special pumpkin. First, he washed all of the dirt off the pumpkin, then he cut into the pumpkin and took out all the yucky squishy stuff--he took it to the compost pile, never to be seen again. Then the farmer gave the pumpkin a new face, with triangle eyes, a square nose, and a big wide smile. Next, the farmer put a candle inside his pumpkin and lit it. The pumpkin glowed and lit up the night. The story continues, "all the neighbors knew that, once again, the farmer had turned a simple pumpkin into a simply glorious sight." Of course, it says right in the title that it's a parable...have you been following along with me? Let me give you a hint. The last sentence of the story reads: "In the same way, God the Father offers his children the chance to be made new, full of joy and full of light, shining like stars in a dark world." So, let me spell it out for you. When the farmer washes the pumpkin, that's like us being washed in the waters of baptism. When the farmer removes the squishy pulp, that's like God taking away all the yucky stuff in our lives--our sins--away, never to be seen or thought of again. The pumpkin's face symbolizes us becoming new creations in Christ, and the light from the candle is Jesus' light shining through us for the world to see. Check out Pal's expression! She was not liking this part--that was some slimy gunk in there. Next we gave our pumpkin a new face, and placed a lit candle inside, so that the light shone out into the world. Because so often, in those waiting times, it feels so dark, so cold, so lonely. Waiting feels like winter. And just as every year winter gives way to the blooms of spring, so too, our times of waiting will burst forth into times of joy--it is by walking through our darkest times back into the light that we can experience our greatest joy. To me, this song is about trust. Trusting that God will see us through our darkest times, and giving up our own desires about when and how. Knowing that God is there, even if it doesn't feel like it, and worshipping through those cold, dark days, even if we don't feel like it. Here's a picture of Code-man's new bed...some people wanted to see pictures, but there really isn't much to see. It's pretty high--taller than me. When I went in to pray with him tonight, I couldn't put my hand on his back or head, as I have done pretty much every night for the last 10.25 years. It made me wonder how much longer he and I will pray together at bed time. Actually, if things keep going the way they have been, pretty soon I'll be going to bed before he does. My baby is growing up. A few weeks ago, Code-man told me about a conversation that he had with one of his friends. They were talking about how when they were younger (like waaaaay back in 3rd or 4th grade), the 5th graders all looked so big, and seemed so old, and they couldn't wait until they were in 5th grade. It was almost as if 5th graders had taken on superhuman status in their 3rd and 4th grade minds. But now that Code-man and his friends are 5th graders, they just seem normal to themselves. They were saying, "we're not as big as those other 5th graders were," and commenting on how it's not quite as much fun as they thought it would be. I kind of feel that way about being a grown-up. When I was younger, the grown-ups looked so big and seemed so old, and I thought it would be fun to be one, in fact, I couldn't wait. But now that I am a grown-up, I kind of can't believe it. Seriously? I'm responsible for the well-being of, not just myself, but of 3 defenseless kidlets? Who thought that would be a good idea? Really! It seems ridiculous to me (but then I wasn't really the one deciding that I was a good candidate for grown-up-ness). I would so much rather have someone else be the grown-up. Ah, but the fact remains that I am, alas, a grown-up, and as such, I am supposed to be in charge of those little'uns. I guess it's a good thing that they're less complicated when they're babies. When a baby is upset, he will cry, and then a consciencious care-giver need only run through the list of possible factors: hungry, tired, lonely, wet/dirty diaper, gas. We make mistakes and we grow and learn along with our children. And as they grow, the factors become more complicated; the potential influencers: myriad. Hopefully (and I emphasize the hopefully), by the time we get to the point where there's more at stake, we will have made enough mistakes, and learned enough, that we will somehow (somehow) stumble upon the right thing to do, so say, or even, not to do. But oh, I feel so inadequate. How does one ever know the "right" thing? I am so not the right person for this job...and yet, I'm the only person for this job. And so, we carry on. All we can do is our best. Bubby got to go, too! I think we're all waiting for something, aren't we? The thing for which we wait may not be as potentially devastating as my friend's test results may be, but we're all waiting for...something, maybe even several somethings. Right now I'm waiting for Bubby to fall asleep. I'm waiting for Hubby to return from work. I'm waiting for an answer to prayer. I'm waiting for my children to start cleaning up after themselves without being told. And I, too, am waiting for J's test results. Waiting. Always waiting. It is so hard to wait. I think the hardest part about waiting is that there's nothing else we can do. Once J has her test results, she can take action, or at least formulate a plan, or not, because she may no longer need a plan, if the results are what we're hoping for, but in this time of waiting, all she can do is...wait. We are such action oriented creatures, we humans. It's as if we believe that as long as we're doing something, anything, we are in control; we can control outcomes. And yet, experience shows that most of the time, the something, anything that we do does nothing more than to increase our anxiety about whatever it is for which we wait. Have you heard "While I'm Waiting," by John Waller? This, I believe, is how we should wait: hopefully, patiently, peacefully, faithfully, even though waiting is difficult and often painful, walking through our times of waiting in obedience and in confidence, knowing that God is present in every moment, God is in control, and that God will see us through to the other side. And if we must do something, anything, we should serve God and worship God as we wait.